When I think of progressive metal, I usually think of dark riffs that chug unpredictably as drums hammer out polyrhythms and vocals scream with rage. This was the mindset I approached True North with, so I was caught completely off guard by Dawnlit’s undeniably cheerful style. This EP is a ray of sunlight in a genre dominated by darkness. While it still has intense rhythms and heavy riffing, an emphasis on major chords and a skillful use of breathing room give True North a lighthearted mood. 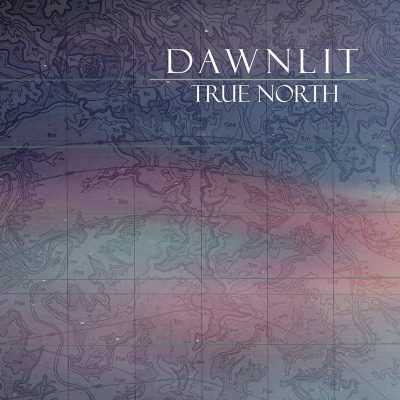 If you’re looking for sounds that make you want to bang your head and at the same time bring a joyful smile to your face, then I recommend picking up Dawnlit’s latest release. True North is the wind rushing past your face as you’re driving top speed down country roads just before sunrise. Bass and guitar riffs whiz by in an air of anticipation—piano melodies whisper soothingly as the scenery rushes past, and the whole scene is completed by a rhythm that swerves between crunchy headbanging and calm wandering. Take “Lithic Space” for example: It starts with calm guitar plucking before exploding with energy, kicking on the distortion and riffing out for a bit before opening back up and relying on rhythmic kicks for a tight finish. “We Are Creating It, We Are Conjuring It” keeps things a bit heavier, starting with catchy rhythmic riffing and cleverly mixing in a soft piano melody to relax the band’s vibe. All of the songs off this EP are both serene and badass.